I am just about finished reading Brian Steel Wills’s new biography of William Dorsey Pender. It’s a solid biography, just what we’ve come to expect from Wills. Indeed, he has been very productive in recent years. Pender’s letters to his wife Fanny are front and center in this biography. One of the most interesting sections occurs early on in the book when Dorsey is chided by his wife for admitting to flirtatious behavior with women in Suffolk, Virginia, who he openly admitted, “will do anything for me.” That’s probably not what you want to write to your wife, who is struggling back in North Carolina to take care of two young children. Live and learn. Even more interesting, however, is the revelation that shortly after the Antietam Campaign Pender chose to read Harriet Beecher Stowe’s Uncle Tom’s Cabin. Joe was one of Pender’s body servants during the war. Wills includes a number of references to body servants, but this is a case where I wish he had taken the analysis a bit further. First, why did Pender choose to read Stowe at just this moment in the war? Wills argues that “slavery was more practical than political” for Pender, though this distinction is not clear in my mind. Even more curious is the author’s claim that Pender never questioned the place of slavery in southern society, which leaves open what exactly he found himself in agreement with re: Uncle Tom’s Cabin. One of the things that I am struggling with in the first chapter of my book on camp servants is in illustrating how the challenges of camp life, marching and battle shaped the master-slave relationship. Pender, like others who brought slaves with them into the army, seems pleasantly surprised by Joe’s ability to adjust to the rigors of life away from home. No doubt, seeing Joe in this new light challenged some of Pender’s assumptions about his abilities and character. But Pender’s referencing of Stowe’s book in this particular paragraph leads me to wonder whether the book itself aided in stimulating Pender’s apparent sympathy for Joe. Be warned that I know almost nothing about Pender and have never read Uncle Tom’s Cabin. That said, I have observed in other readings an internal tension in believers in a divinely ordained master-slave order, and its obviously un-divine abuses that they see. That is probably where Pender’s and Stowe’s worldviews intersect. 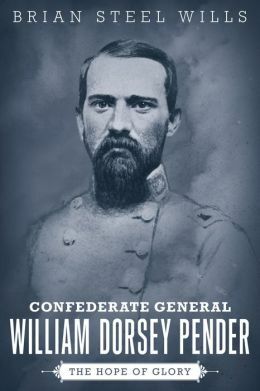 I don’t know of another Confederate general who read this book during the war. Would love to know how he acquired it and why he was moved to read it at this time. Admittedly, I don’t know much about Pender either but I don’t find it surprising that he read Uncle Tom’s Cabin. As Sarah Meer and others have shown, many southerners were borderline obsessed with Stowe’s novel. As you note, what’s unique here is that Pender claims to agree with Stowe. Most southern readers certainly did not have the same reaction. I too wonder what exactly he means by this. If the book caused Pender to view his slaves in a new light, it’s worth noting that it had a similar effect on many northern soldiers. Union officers, in particular, provide a useful analogy here. Many of them took in contrabands as personal servants and the way they perceived and treated these African Americans was often shaped to some degree by Uncle Tom’s Cabin. As Sarah Meer and others have shown, many southerners were borderline obsessed with Stowe’s novel. No doubt, but I still find it interesting that he chose to read it during the war. I’ve never heard of another Confederate officer doing so. If the book caused Pender to view his slaves in a new light, it’s worth noting that it had a similar effect on many northern soldiers. The more I read the passage that less I am convinced that Stowe is the primary influence at work here. Pender exhibits some of the same responses to his slave that others did during the war. I see this more as a function of his close relationship with Joe rather than the work of a novel, though it clearly had some impact on his attitudes. I didn’t mean to imply that the book was the only thing shaping Pender’s view of Joe – just that it may have helped. That being said, I can’t help but be a little dubious of its impact on Pender. I’ll second your observation that, to my knowledge, this is the only recorded instance of a high-ranking Confederate reading the book during the war. It’s an odd choice for sure but I guess Stowe’s just as good as anything else for a Confederate officer sitting around camp looking for something to do.